Janelle In Real Life: fall inspiration and a fab group giveaway! fall inspiration and a fab group giveaway! Hey there friends. It's time for a little pre-fall style inspiration! And to preface, I have a slight obsession with grandpa sweaters so you'll probs be seeing lots of those. I just love this mustard color for fall! Also, I love boot season and these booties in particular. 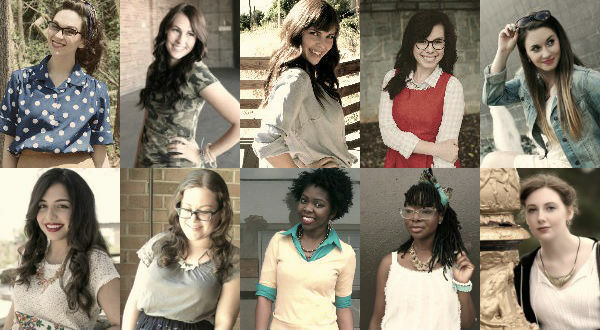 In other news, I'm participating in a fab group giveaway with some lovely ladies! 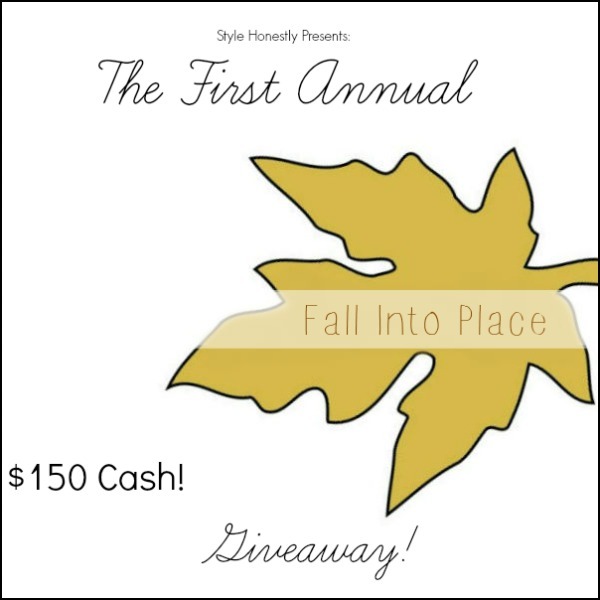 We'll be giving away $150 in paypal cash to one super lucky winner! Make sure to enter and best of luck to you! Aaaand, don't forget to enter the other giveaway I have running right now... a gift card to Forever 21 (enter here)! It ends this Friday at midnight, so make sure to enter before then! I LOVE this outfit!! 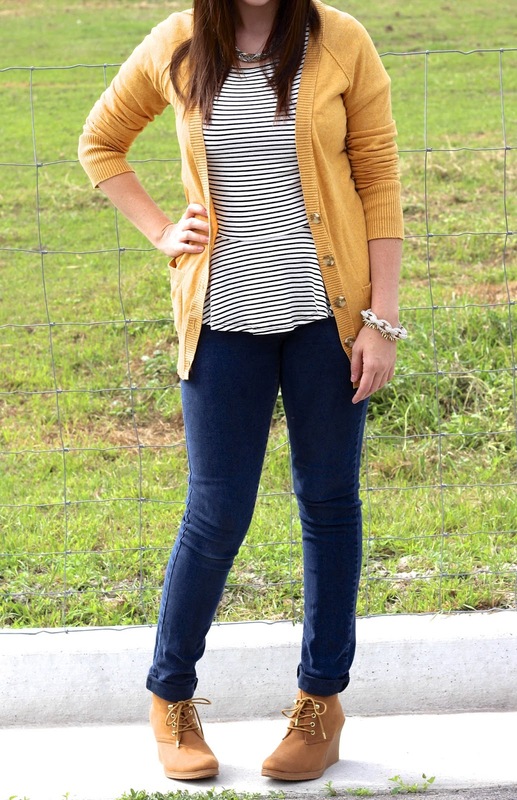 Two of my favorite things are yellow & Stripes.. and this is so cute with those shoes! So glad you like it! I just love wearing the fall colors. Love the mustard color of your sweater! Thanks for this awesome giveaway opportunity! I'm seriously loving mustard lately! And so glad to be part of the giveaway, definitely enter... hop you win! I'm just waiting for the cooler weather so I can wear cardigans ALL.THE.TIME. love the mustard color! Reminds me I need to find a sweater like yours before it gets cool here. Great look! 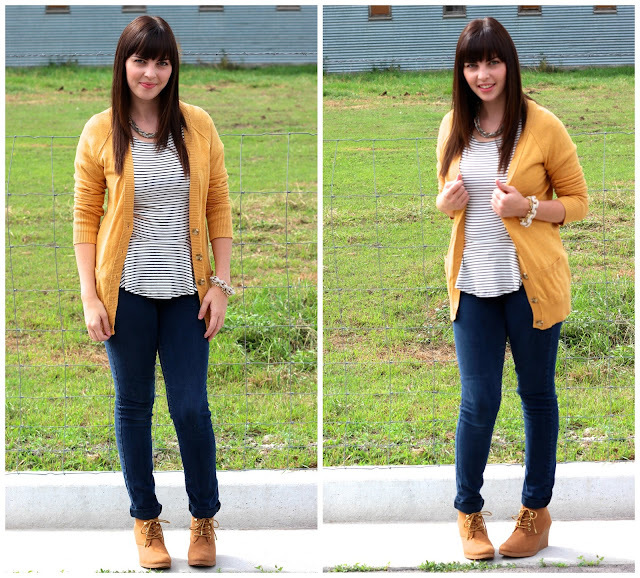 I love the top and the mustard cardigan! It looks great! I would use the money to get some items for my new teaching job!